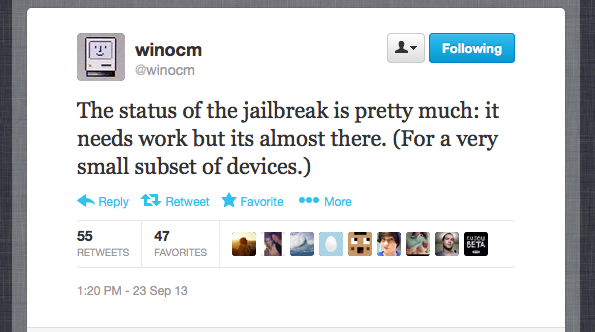 Hacker winocm, who previously demonstrated a jailbreak of the iPhone 5 on iOS 6.1.4, has tweeted with a minor status update. At this point in time its unclear which devices winocm is planning to support; however, it's likely that the iPhone 5 will be one of them. In early September, he tweeted photos of Cydia running on an iOS 6.1.4 iPhone 5. Previously, he also indicated the successful jailbreak of the iPhone 4 so that's another device that could be supported. Please note, this is not a jailbreak for iOS 7.